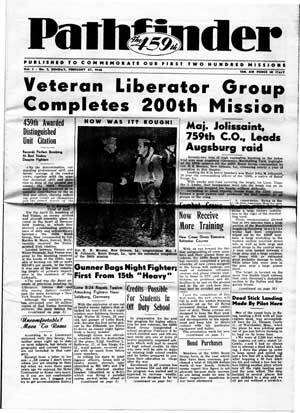 Subscribe by joining the 459th Bomb Group Association, Annual dues $ 10,00, Life $ 75.00, 4 issues per year. Contact Treasurer Gerald Greemore. All Quaterly Back Issues of the 459th Bomb Group Association`s "Pathfinder Newsletter" from 1984 thru mid 2002 are available on one(1) CD Prepaid for $ 10.00 mailed. To Order Contact: bgweb459@hotmail.com for details. The new Editor of the Newsletter is Brian Maxwell Smith #1494, 2024 Crosscrest Dr. Hoover, AL 35244. Email bmaxwellsmith@yahoo.com. He plans 4 seaonal issues mailed in January, April, July and October. Please send requests, contributions, photos and articles to him for publication in future issues. A membership survey for a 2008 Reunion will be included in the fortcoming issue and is also posted on this website under Coming Events. This set of 2 CDs contain 470 slides in Volume 1 and 700 slides in Volume 2 with WWII Histories of the 15th Air Force,304th Bomb Wing and its 4 Bomb Groups- the 454th,455th,456th and 459th; 459th Bomb Group(and other Groups) Combat Mission Lists, Mission Aerial Photos,Flimsys & Flak Maps, Mission Stories, Mission Breifings, Ground Air Raid Photos, 459th Giulia Airfield and nearby Cerignola,Italy Photos, B-24 Ground and Air Photos, Fighter Escorts and other WW II data never before published. This CD set is available Prepaid for $ 25.00 mailed. To Order Contact: waltman2@peoplescom.net for details. Read The 1st Issue of the Pathfinder (Be patient it may take a few minutes to download as it is 35meg).